I received an e-mail from Trace Burroughs in January of this year. His company, Little Men Entertainment, was looking for illustrators to collaborate on animation projects. Little Men would take the illustrators work and animate it using Adobe After Effects in the "Cut and Paste" style of "Hopeless Pictures". I was intrigued and responded. Trace made it clear that neither of us would be making any money, but he would have my work on his reel and I would have a finished animation. We might, down the road, profit from the collaboration, but there were no guarantees. What the hell, I thought, why not? I said I'd do it if I could create new art, the story and the music. Trace wanted to keep the animations brief & fairly simple. I wrote a simple story & he approved it. I then sent him a batch of finished art: main characters, body parts, buiildings, vehicles & backgrounds, so he could assemble them into a finished animation. Once the movie was nearly done & we had an idea of the movie's length, I created the music. Trace did all the animation and added the sound effects. Maggie designed the Acme Wigs billboard. 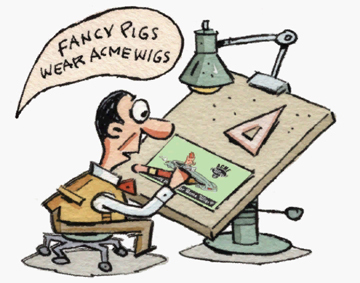 Click on my name, which is the first one under "Illustrator Collaborations" to view "Fancy Pigs Wear Acme Wigs". Don't feel obligated to purchase an Acme Wig.